A moderately inexpensive, relatively young, rye whiskey from a mainstream American mass market distiller... But I was extremely impressed by a smooth, creamy, floral, and beguiling rye with an unusually gentle character. 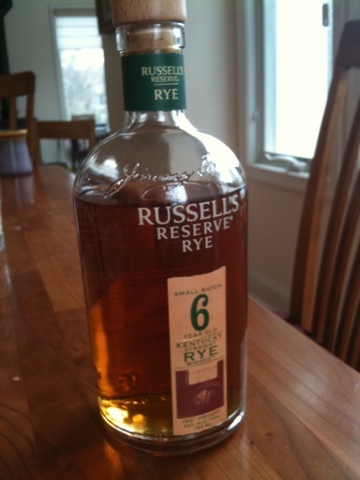 Russell's Reserve Rye 6 45% abv. A lovely rich golden amber in the glass. The nose, after extended air (10-20 minutes) is delicate yet rich with honeysuckle, vanilla, lanolin, mineral and some sweetness with a vegetal components - alfalfa treacle? It's a light and lovely smell that is soothing and yet appetizing. Entry is off-dry (slightly sweet) with dry cereal and a peppery quality that almost feels like the effervescence of soda. Midpapalate expansion is sweet with rich cereal sugars, oak vanilla floral essences, some sherry toffee notes, and a big dose of cream. The creaminess carries into the long and elegant finish with more peppery notes balanced by that sweet floral cream, fading into light wood tannins. Lithe, fruity, floral, sweet and kissed with clean oak; Russels 6 takes rye into a sweeter, lighter, more feminine place than I usually experience rye. I like it... Wait, I LOVE it. A quiet and unassuming knock out. (FYI - the mainstream American mass market distiller is Wild Turkey. The name "Russell" refers to the father and son master distilling team behind Wild Turkey's success). Find a good distiller and enjoy their talents - that's good advice I try to live by. I have been quite impressed with the Russell family's work.